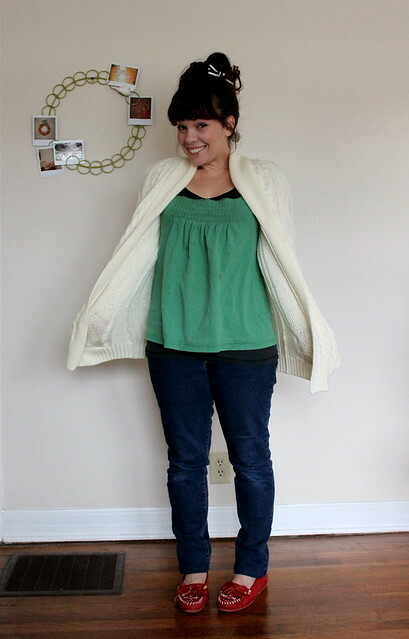 This week's feature is Everyday Wear and how we wear vintage in a casual way. The last few days we've had weather dip into the single digits in Southwestern Missouri and got our first snowfall! Needless to say this mama hasn't necessarily been dressing to the nines to fight the biting wind in between the car and the grocery store. I wear jeans more often than not when I'm staying at home but I like to keep it interesting when I can. I have a few pairs of vintage shoes that I shuffle through but not many sweaters or tops so when Rubyellen said we could borrow an item from her friend's Etsy shop, Adelaide Homesewn, and share it in our weekly feature I immediately thought of something in the grandpa cardigan category! It has kept me super warm all day! If I were to fancy this up a little I'd pair it with a light, feminine dress and cinch it with a belt and add a pop of color with bright tights and a neutral boot. Rather just throwing the hair back in the usual ponytail I gathered it into a messy bun with a little curl sticking out on the side and snuck in a bow that Elsie gifted Ruby as part of her birthday present. Since Ruby doesn't have much hair I figured she wouldn't mind if I put it to good use. ;) My curls tends to soften a little on day two and I can usually get away with going three full days without washing it again if I take a curling iron to it to smooth things out. This comes in handy when naps don't last long or deadlines need to be met! 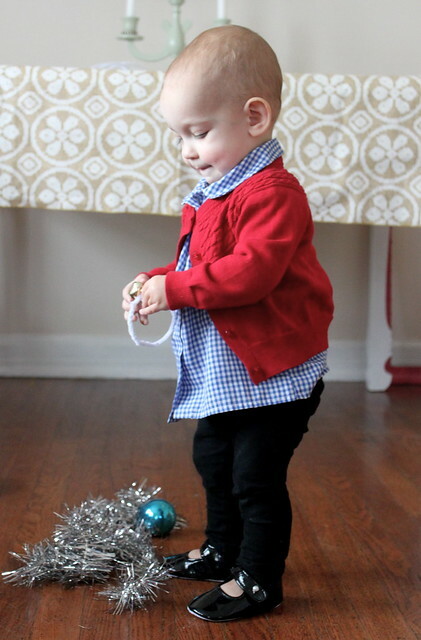 Ruby's everyday wear is not quite as casual because I know my days for dressing her in what I want may be numbered. She's a squirmer when it comes to putting any clothes on and it takes some creativity, a little distraction, bad singing, and props to get her dressed in the morning. 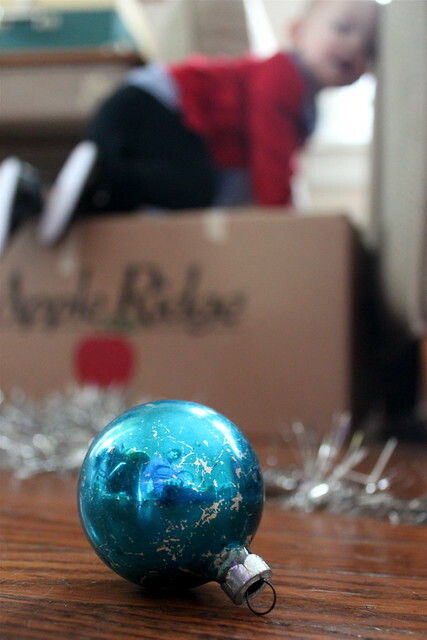 Apparently tinsel and shiny Christmas ornaments are only fun to get into when Mama isn't offering them to you in hopes to get a head to toe shot! 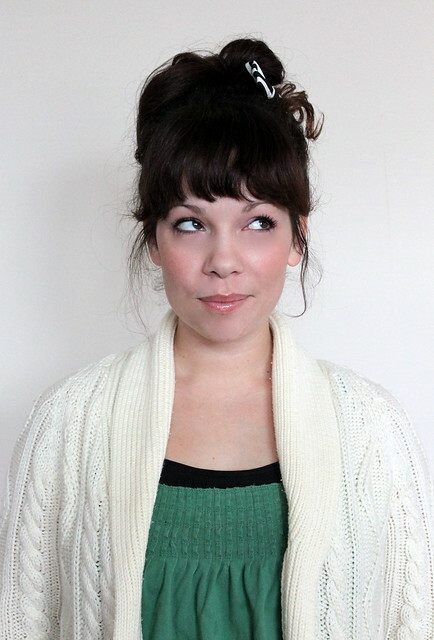 Here are a few of my favorite cardigans and sweaters from vintage Etsy sellers. They may be the easiest article of clothing to buy sight unseen! What kind of vintage do you sneak into your everyday wardrobe? Does it feel like a special piece or just as ordinary as something from your favorite big box store? What have you been on the lookout for lately? Head over to Rubyellen's blog for more Everyday Vintage and browse through past features below. I'd like to thank Adelaide Homesewn for sharing items from her shop this week. She carries pretty special pieces in her shop and is a new favorite seller of mine. If you have your own vintage outfits to share link up in the comments section for all to see! that outfit is the cutest! i love the grandpa sweater, it looks so warm & comfy! You make the whole thing look so effortless! Which is completely awesome. I went thrifting today and brought home like 15 little girl dresses. I am seriously drawn to the little smocked tops I think. I have 7 "new" one's. So pretty. I love this vintage feature by the way! I love vintage clothes that are everyday wearable and colorful!! Those are the best!! This series is really cute! Love the mocs. I've never seen those in a thrift store around here. Your cardy reminds me that I want one of those 70s ones in cream with the big wooden buttons. :) Stay cozy! 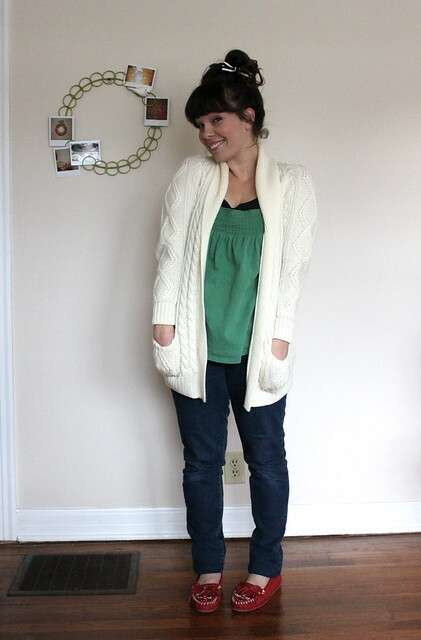 casual vintage or everyday wear is my favorite! Your outfit is really cute, and your hair looks really pretty worn up that way. Also, I just had to say... Ruby is probably one of the most well dressed babies I have ever seen. I LOVE the last picture of you :) Your hair is adorable!!! eeekk.......how adorable is Ruby's outfit this week!! She looks so cute + hip!! Just scored myself 3 cute summer vintage dresses (that didn't cost the earth)!! Just wondering maybe you might make a feature 1 week about mixing vintage with new clothes!!?? Thats where I'm at! OMG! You ladies are adorable! I love love Rubys outfit!! cute outfit, and totally wearable!! You are such a doll! love the curl and that cute little bow. the grandpa cardy looks super comfy. And I just found a pair of vintage moccasins at my fave thrift store. heaven!